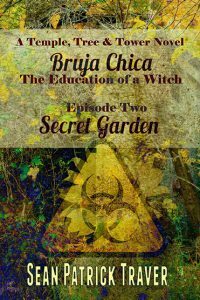 BRUJACHICA is an episodic series of eight novellas, published by Omnium Gatherum. 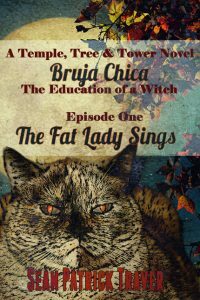 The first and second volumes, THE FAT LADY SINGS and SECRET GARDEN, are available now, with subsequent installments to follow. Tomas Delgado, the ghost of a century-old necromancer who currently resides in the body of a black cat, takes a young orphan-turned-witch under his tutelage. This episodic tale takes us from Tom’s earliest efforts to provide shelter and food for a young girl in an unforgiving urban landscape to her eventual maturation into a powerful sorcerer who must decide how to use her extraordinary skills in the everyday world. MAGIC /maj’ik/ n. 1: The art and science of causing change to occur in conformity with will (Aleister Crowley). 2: The manipulation of symbols, words or images to achieve changes in consciousness (Alan Moore). 3: A basic imagination technology (Grant Morrison). See WITCHCRAFT.